The two most common causes of pain in the bottom of the heel, the arch, or both the heel and the arch, are plantar fasciitis and heel spurs. Plantar Fasciitis is an inflammation of the plantar fascia. The plantar fascia is a thick ligamentous/fibrous band on the bottom of the foot that is attached to the heel, and runs forward to insert into the ball of the foot. Plantar fasciitis is a painful inflammation of this band, which usually occurs at its attachment to the heel; however, the inflammation and pain of plantar fasciitis can occur anywhere on the plantar fascia. A Heel Spur is a piece of calcium or bone that sticks out from the bottom of the heel bone, and lies within the fibers of the plantar fascia. When walking, the spur digs into the plantar fascia and causes small micro-tears in the plantar fascia. This produces inflammation and pain in the heel, which at times may radiate into the arch. 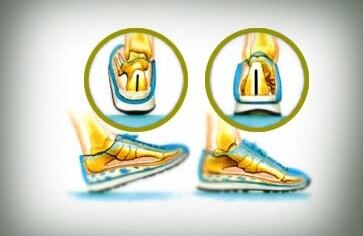 The chief diagnostic sign of these problems is pain in the bottom of the heel or arch when first standing, which gradually improves with walking. This pain may later return with continued walking. The pain usually subsides after a period of rest. Causes are many and varied, but may be due to excessive pronation (see explanation below). It is a very specialised condition requiring specialised knowledge and treatment. Achilles Tendonitis is an inflammation of the Achilles Tendon. This tendon allows the muscles in the calf of the leg to attach to the back of our heels. The Achilles Tendon is a long and thick tendon, which moves our foot down, so that the toes point to the ground (plantarflexion). The most common site of Achilles Tendonitis is at the heel to 4 inches above the heel. Most Achilles symptoms are traceable to excessive pronation that literally “bows” the tendon causing constant strain. When recurring heel pain occurs in children, it is usually due to Sever’s Disease, while adult heel pain is usually due to heel spurs or plantar fascitis. Apophysitis is an inflammation of a growth plate. Calcaneus is the anatomical name of the heel bone. Sever’s Disease is an inflammation of the growth plate located at the posterior aspect (back) of the heel. Sever’s Disease is most commonly seen in physically active girls and boys from ages 8 to 15 years old. These are the years when the growth plate is still “open,” and has not fused into mature bone. Also, these are the years when the growth plate is most vulnerable to overuse injuries, which are usually caused by sports activities. Description: This term usually applies to pain in the front of the leg, occurring anywhere between the ankle and the knee. However, it can also refer to pain in the inner side of the lower leg. The pain in both of these areas is usually initiated by walking, running, or jumping. In extreme cases one can have pain in these areas while just standing still. Anterior Shin Splints: The muscle in the front of the leg which usually becomes painful is the Tibialis Anterior Muscle, which is encased in a thin sheath. This muscle attaches to the foot, and flexes your foot upward, or back towards the shin; and as long as the foot is in proper alignment with the leg, the muscle functions efficiently and pain-free. However, when the foot is pronated (the foot rolls outward at the ankle and you walk more on its inner aspect), the Tibialis Anterior Muscle twists within its sheath. This twisting of the muscle within its sheath can cause tiny tears in the muscle, or the muscle rubs abnormally against its sheath, and produces inflammation and pain. Posterior Shin Splints: The muscles most affected in this type of pain are the Soleus and the Tibialis Posterior. In the leg, these muscles are firmly attached around the back of the knee. They run down the back and inner side of the leg, and attach to the foot. If the foot is in a proper alignment to the leg, these muscles function efficiently and pain-free. However, when the foot is pronated (the foot rolls outward at the ankle and you walk more on the inner aspect of the foot), these muscles are forced to become twisted as they attach to their respective foot structures. The twisting of these muscles can cause tiny tears in the muscles, or the muscles become “pulled” and inflamed. This will produce pain. pain near the knee cap (patella), and below it. The pain is located on the anterior surface (front) of the knee, not deep within the knee joint. you may feel and hear a “grinding” when the knee is flexed and extended. pain after sitting with the knees bent for a time, and then standing up and walking. walking or running downhill, or walking down stairs may produce knee pain. direct pressure on the knee cap may produce pain. the area around the patella may swell when pain is present. The patella tendon joins the kneecap (patella) to the shin bone or tibia. This tendon is extremely strong and allows the quadriceps muscle group to straighten the leg. The quadriceps actively straighten the knee in jumping to propel the individual off the ground as well as functioning in stabilizing their landing. As such this tendon comes under a large amount of stress especially in individuals who actively put extra strain on the knee joint such as those who regularly perform sports that involve jumping movements and changing direction. With repeated strain, micro-tears as well as collagen degeneration may occur as a result in the tendon. This is known as patella tendinopathy or Jumper’s Knee. It should be distinguished from patella tendonitis as this condition indicates an inflammation of the tendon whereas tendinopathy is more about degeneration of the tendon. Osgood Schlatter’s disease is a very common cause of knee pain in children and young athletes usually between the ages of 10 and 16. It occurs due to a period of rapid growth, combined with a high level of sporting activity, involving kicking, running, or jumping. These kinds of sports cause repeated and vigorous use of the quadriceps muscles. It causes pain and swelling just below the knee. Young teenagers, particularly boys, are the most commonly affected. It is uncommon over the age of 16. The main symptom is pain just below the kneecap (patella). The severity of the pain tends to flare up and down. It is usually worse during, and just after, activity. It tends to ease with rest. The pain typically lasts a few months, but sometimes persists until you have finished growing. This means that in some cases it can last up to two years. A small, tender, bony bump may develop a few centimetres below the kneecap. This occurs where the patella tendon attaches to the tibia (shin bone). The small bump is permanent, although in time it becomes painless. The actual knee joint is not affected, so knee movements are normal. Symptoms usually occur just under one kneecap, but in up to one in three cases it affects the area under both kneecaps. The most important structures in the balls of the feet are the five metatarsal heads (the ends of the metatarsal bones that connect to the toes) and the protective fatty pad that cushions the ball of the foot. Each time we take a step forward, we push-off with our toes and the ball of the foot, forcing ourselves forward. To do this, we force 100% of our body weight on these structures. If they are not aligned perfectly, or if we have insufficient fatty padding, we experience pain in the ball of the foot. Pain in this area can emanate from dropped metatarsal heads, Mortons neuromas, fractures of the metatarsal bones, or excessive pressure from a high arched foot. Calluses are areas of hard dead skin found on the bottom of the feet. The most common calluses are found on the balls of the feet. These areas of hard dead skin can be diffuse, and spread over a broad area, or they can be localized to a small area, and be very deep. Both types can be very painful! Calluses are a symptom of some underlying problem which exists in the ball of the foot. The normal foot can carry our weight comfortably, without the formation of calluses and pain. When a callus occurs, it signifies a change is occurring in our metatarsals. When one or more metatarsals carry more weight then they are supposed to, the skin under these bones becomes thick, hard, and painful. A bump that develops on the inner side of the foot, in the area where the big toe and the bone it connects to (called the first metatarsal) meet. The turning inward of the big toe, so that it presses against the second toe (the big toe is no longer straight). Bunions are a progressive deformity, and if left untreated the bump will become larger, and the big toe will eventually lie over or under the second toe. Orthotics can address many of the mechanical causes of a bunion. While orthotics do not actually correct a bunion deformity, if properly designed and made they can slow the progression of bunions. They are also made to redistribute weight away from pain in the foot which often accompanies bunion development. injury to the big toe may damage the first metatarso-phalangeal joint and speed up bunion formation. Arthritis of the first metatarso-phalangeal joint may cause the joint to become enlarged, and a bunion may then form. Some neurological diseases cause contractures of the joints of the feet and toes, helping bunions to form. Stress fractures are fractures of the metatarsal bones, which usually occur without one serious injury to the bone. They are usually caused by excessive pressure being applied to the bone, either suddenly or over a period of time. Stress fractures are a thin crack in the metatarsal bone, without separation of the fractured pieces. These fractures may not show up on an x-ray until healing begins, which can be up to 3 weeks after the injury. Morton’s Neuroma, is a benign soft tissue mass that forms on the nerve which runs between the metatarsals, in the ball of the foot. When two metatarsal bones rub together, they pinch the nerve that runs between them. This repeated pinching, or repeated injury to the nerve, will cause the nerve to swell, and eventually a benign mass occurs at the site of the repeated injury. This mass is known as a Morton’s Neuroma (named after the physician who first described this mass, in 1876). The normal arch functions as a shock absorber for our entire body. Each time we step down, we place up to four times our body weight on the foot, depending on whether we are walking, running, or jumping. If there was no shock absorber in the foot, the force of each step would eventually fracture or dislocate the bones of the foot, leg, and lower back. If left untreated, this will lead to a completely collapsed foot which cannot function as a shock absorber at all; and, this in turn will cause constant pain in the foot, and eventually the knee, hip, and lower back. Pronation is a turning outward of the foot at the ankle, so that one has a tendency to walk on the inner border of the foot. When a foot and ankle pronates to a great degree, we call it over-pronation. You can test for pronation by looking at the leg and foot from the back. If left untreated, pronation may be the cause of heel spurs, plantar fasciitis, frequent ankle sprains, shin splints, weak and painful arches, and eventually knee, hip, and lower back pain. Children: If pronation is diagnosed before the age of five it can usually be treated in such a manner that the bones and joints will be aligned properly as growth continues. This will prevent the arch from collapsing, as well as allowing the muscles of the leg to enter the foot without twisting. With proper and early treatment, the foot will not turn out at the ankle, and the child’s gait will improve. Treatment for pronation in children may include: night braces, custom-made orthotics, and exercises. These treatments usually continue until growth is complete, and then the adult may need to wear custom-made orthotics to prevent the pronation from returning (the foot, as every other part of our body, tends to return to its original form if preventive measures are not taken). Frequently, paediatricians will wait too long, hoping that the child will “outgrow” the problem. By the time they realize that the child’s feet will not improve, it is too late to change the foot. In these cases, custom-made orthotics are used to prevent the pronation from becoming worse. Adults: The only effective treatment for pronation is custom-made orthotics. Pronation forces us to bear most of our weight on the inner border of our feet. Custom-made orthotics gently redistribute the weight so that the entire foot bears its normal share of weight with each step we take. The foot will not twist out at the ankle, but will strike the ground normally when the orthotics are used. This action of the custom-made orthotics will help to prevent: shin splints, ankle sprains, knee and hip pain, lower back pain, nerve entrapments, tendonitis, muscle aches, bunions, hammer toes, and calluses. Custom-made orthotics support not only the arch as a whole, but each individual bone and joint that forms the arch. It is not enough to use an over-the-counter arch support, as these generic devices will not provide the proper support to each specific structure of the arch and foot. Each pronated foot’s arch collapses differently and to different degrees. The only way to provide the support that you may need is with a custom-made device. This action of the custom-made orthotic will help to prevent: heel spurs, plantar fasciitis, calluses, arch pain, and weakness of the entire foot. Custom-made orthotics will reduce the twisting of the leg muscles as they enter the foot, by maintaining a normal alignment of the bones and joints of the foot. If the bones and joints are aligned properly, by reducing the pronation, the muscles can run straight to their attachments in the foot, without twisting to get to these bones. This action of custom-made orthotics will reduce Achilles Tendonitis; shin splints; ankle, knee, hip, and lower back pain; and leg cramps. This action will also allow the leg muscles to work more efficiently, thus allowing you to walk and run with less effort. With every step we take, we place at least two and a half times our body weight on each foot (as we walk faster, or run, we can exert more than four times our body weight on each foot). As this amount of weight is applied to each foot there is a significant shock passed on to our body. Custom-made orthotics will absorb a considerable amount of this shock, helping to protect our feet, ankles, knees, hips, and lower back.